by Dorrie Russell Sacksteder, M.S.L.S. Cyrus and Sarah Moore moved from Pennsylvania to what would eventually become Brush Creek Township, Jefferson County, Ohio, in 1816. They had 10 children (5 girls and 5 boys). This genealogy tracks many of Cyrus and Sarah Moore's descendants to such places as Athens and Jackson Counties, Ohio, Holt County, Missouri, and Decatur County, Kansas. The book contains a surname index and bibliography, and is privately published and printed by the author. Dorrie Russell Sacksteder has a Bachelor's Degree in History from Muskingum College, and a Master of Science in Library Science from Clarion University of Pennsylvania. 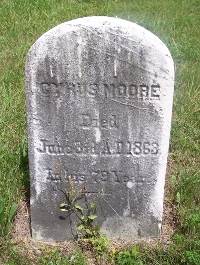 She is a 5th-great-granddaughter of Cyrus and Sarah Moore, and grew up less than a mile from what was their homestead in Jefferson County, Ohio.